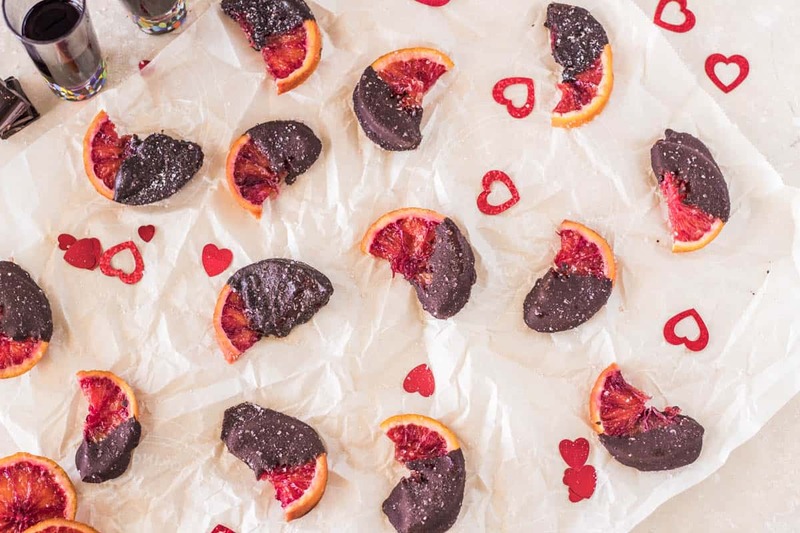 Beautiful slices of the distinctive vermillion blood orange simmer in sugar syrup until they’re chewy and candied, they then get dunked in dark chocolate, and sprinkled with Himalayan Pink Sea Salt…Chocolate Dipped Candied Blood Oranges are beautiful to behold, and even better in your mouth! Valentine’s Day is just days away… What are you doing for that special someone in your life? Nothing says “I love you” quite like sweets you’ve made yourself! A gift of your time speaks volumes given the chaos of our lives in 2017. I am honored to join several fantastic bloggers in bringing you some amazing ideas for sweet treats that are sure to bring a smile. 🙂 Find 10 more fabulously romantic sweets recipes at the bottom of the post (just above my recipe)! If you’ve been reading Beyond Mere Sustenance for any length of time at all, you’ve probably heard me wax poetic about the beautiful blood orange. Texas’ Rio Grande Valley is known for its citrus, and I look forward to these beautiful oranges every year! Just last week, I posted Pressure Cooker Pork Roast With Blood Oranges, and I will have have a Blood Orange and Pisco Cocktail for you next week. If you’re like me, and eat with your eyes, blood oranges take center stage. So, on to the recipe for my Chocolate Dipped Candied Blood Oranges. They’re not difficult, but they do require a bit of time. This process takes me about 3 hours start to finish, but it’s not all “hands on.” The oranges get sliced about 1/4″ thick, and simmered in simple syrup for about 20 minutes. Carefully arrange them on a wire rack in a warm oven. I have convection, and find the airflow reduces times by about 20%. The orange slices need to be turned every 30 minutes, and flipped every 60 minutes until they are dry and still pliable. Once they are completely cool, the orange slices get dunked in melted chocolate and lightly dusted with salt. I use a Himalayan Pink Sea Salt; feel free to substitute your favorite! You can follow along on Instagram with the hashtag #vdaysweettreats. Happy Valentine’s Day! 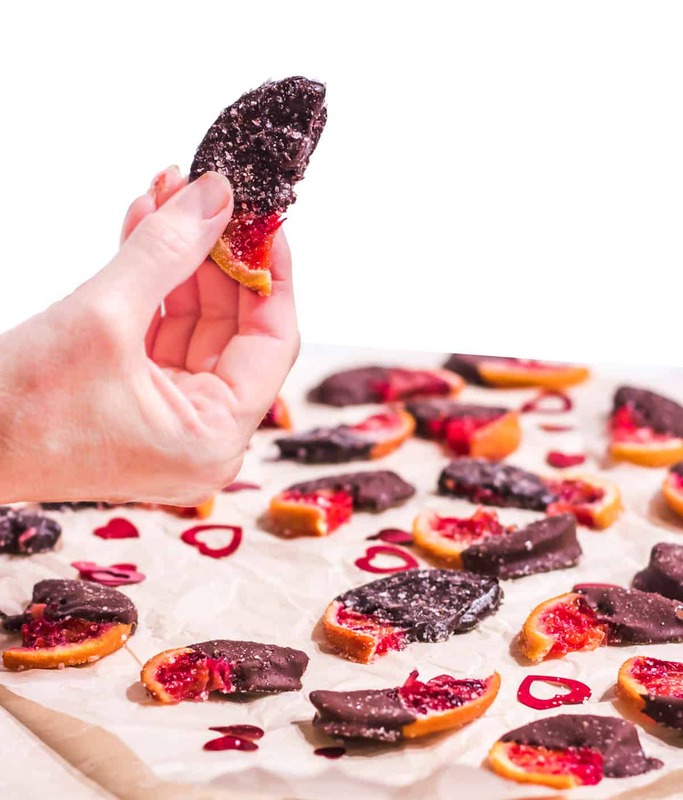 Sweet (but not too sweet), chewy, salty, and rich with a dark chocolate coating... Chocolate Dipped Candied Blood Oranges are a perfect treat to share with your Valentine! Preheat oven to 180 degrees F. Convection (if you have it) saves time and the air flow dries the orange slices more quickly. Combine sugar and water in a heavy-bottom pan over medium-low heat. (I like my large cast iron skillet). Stir until sugar is completely dissolved. Add orange slices in a single layer. The syrup should cover most of the orange slices. Reduce heat to low, and simmer 10 minutes. Turn the orange slices to cook on the other side. Cook an additional 10 minutes. Line a baking sheet with waxed paper, then place a wire rack on top. Carefully arrange the orange slices on the wire rack. The wire rack allows for the heat and air flow to come from top and bottom. They dry more evenly. Allow the orange slices to cool completely. When the orange slices are cooled, slice them in half. This makes them much easier to handle (for the dipper and the eater!). Melt the chocolate. I use a large ramekin in the microwave, stopping to stir every 30 seconds until it's completely smooth and melted. Place a sheet of parchment on a baking sheet. Dip half of each orange slice in the melted chocolate. If the chocolate starts to set up, simply stick it back in the microwave for a few seconds and give it a good stir. Place each on waxed paper or parchment. After ever 2 or 3, sprinkle or grind a bit of sea salt over top. Just a bit! You want a hint of salt, not a salty orange. If the chocolate is still warm, the salt will stick. Continue until they're all dipped and lightly salted. Store in an airtight container with parchment or waxed paper between layers. They will keep in the refrigerator for a few days. A convection oven circulates air, and aids in the drying process. If you don't have one, though, you just need to be a little more patient. Your drying time will probably be at the 2 1/2 hour end of the spectrum. You may substitute any orange for this recipe, but you won't have that glorious color! I used one 4 ounce bar of Ghirardelli Premium Baking Chocolate 60% dark. It works beautifully. There are many types of melting chocolate. Choose your favorite. These are just too pretty. They look like little orange jewels dipped in a heavenly chocolate. And I love that you topped them with a smattering of pink sea salt. It really does bring out the chocolate flavor, doesn't it? P.S. I'm already envisioning how glorious these would look decorating a cake. Beautiful!!! Thanks so much Lynn! Yes, good salt does bring out the flavor of good chocolate... Your desserts are so stunning, this seems a bit simple in comparison. I would love to see you incorporate them atop a beautiful cake! I'll take a whole plate and of course with a glass of port! Sounds divine and can't think of a better way to celebrate the holiday! Port and chocolate are such a fabulous combination, and blood oranges are divine! Thanks Cathy :-) And thanks again for including me in such a fun event! This is a recipe after my own heart! So much flavor going on here! I can't ever resist chocolate and orange together! Great job, my friend! Thank you lovely! I have always loved chocolate and orange, and the blood oranges make me swoon! We eat with out eyes, right? Oh wow! These are such good looking little guys. I am obsessed at the moment with blood oranges and my older son Gavin is too! Combine it with chocolate, and my kids will have me pegged as mom of the month. Poor guys don't have a choice I suppose, but you know what I mean!!! Thanks for sharing this awesome recipe. AMAZEBALLS! Me too Cindy! I've done a savory recipe, this sweet treat, and next week a cocktail with them... They're the bomb! Homemade treats are the best. 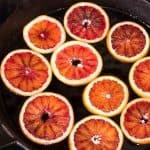 I love blood oranges and these look like they were well worth the effort! Great color! I honestly never would have thought of blood oranges dipped in chocolate, but the red against the brown of the chocolate is so pretty. Also, making the candied slices doesn't seem as difficult as I would have assumed. Thanks for sharing! Such an irresistible little Valentine's treat Tamara!! Nothing better than blood orange season! I absolutely love blood orange! And that colour? So pretty! And I'm the hugest fan of sweet/salty combos so that touch of salt is just perfect. Plus, because it's fruit, it's healthy and I get to eat extra ;) I'm totally with ya with having with a glass of port! Perfect for Valentine' Day. Pinning! Have a wonderful upcoming weekend! Beautiful! And there is no beating the chocolate orange combination in my books :) For some reason, blood oranges are hiding from me this year. As soon as I can get my hands on some, I'll be making these. Happy Valentine's! What a clever idea! I love blood oranges and chocolate but never thought to put them together. Looks delicious. I have a serious obsession with blood oranges, so these are totally calling my name! I mean, chocolate dipped AND candied?!? YESSSSSS! I could eat a dangerous amount of these beauties! So happy to be participating in this virtual Valentine's Day celebration with you! Cheers!